John Cage (1912-1992), whose anniversaries were celebrated last year, is still widely misunderstood, alas. In many cases this is likely to be due to a combination of ignorance and the kind of misinformation which Cage's detractors seem to delight in using in order to discredit the composer's achievements and vision. So it must be that informative, intelligent and well written studies of Cage can contribute to calmer and more thoughtful assessments of this major composer. 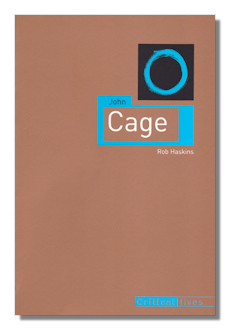 Rob Haskins' (Associate Professor in the Department of Music at the University of New Hampshire) new book, John Cage, is indeed the former; and ought to help to achieve the latter. It's not a long book – at barely 150 substantive pages (there are nearly 30 pages of a variety of references – see below). The study's essence is divided into six thoughtfully-named chapters reflecting the total interconnection between philosophy and music. To understand this relationship, on one level, is important in appreciating Cage. There is a brief introduction that sets the scene and describes Haskins' own growing awareness of Cage; and an epilogue which attempts selectively and convincingly to summarize the achievement, importance and influence of Cage by emphasizing not only the complexity of the composer's work and thinking, but also the strength that is conferred upon these by the heterogeneity and paradoxes and indeed the progressions and developments which Cage's life and work addressed. The main substance of the book is handled, then, by sections describing and analyzing these half dozen facets of Cage: "Becoming", "Audacity", "Non-attachment", "Eminence", "Doyen", "Parting". These are chapters taking the reader along a broadly chronological path which consists of between a dozen or two dozen pages each. Such titles should illustrate the process whereby Cage gradually (though never falteringly) wrestled with the relationship between artist as discoverer (chiefly of already available sounds and their arrangements) and as creator (the "hero" able to create, produce and present sound – thanks to their own personality, experience and skills). When described as well as Haskins does, some of the areas of Cage's work that are more often pilloried and misunderstood – especially chance operations and the role of music to "quiet the mind" – make more and more sense. But Haskins' analysis is rarely restricted to the descriptive. He tackles, for instance, the paradox that Chance must be filtered through a composer's own sensibility and to some extent curbed and/or directed by his/her own parameters, perhaps even unconscious ones. Equally perceptive, and a useful corrective, is Haskins' assessment of Cage more as a writer of music for ("mainstream") performance than a remote and refined philosopher. Especially where reluctant listeners (mis)understand the composer's philosophy; and this inhibits appreciation of the essence and beauty of his music. A more nuanced argument, which Haskins makes well, is that Cage's philosophy as it informs his life and work is less dogmatic and monolithic than is often claimed. Further, it was a natural concomitant of the multiplicity of his interests (or "guises", [p.9]). Cage was an advocate for the modern and unshackled in music, an anarchist, follower of Zen, a visual and textual artist, dance aficionado, as well – of course – as mycologist. Few commentators or critics have aggregated the areas in which Cage was anything from visionary to competent, preferring to examine his work discipline by discipline. Again, ironically, Cage would have approved of such emphasis on the work, not the maker. Although Haskins doesn't stint to shift the emphasis back onto Cage. Nor does Haskins do so just in order passively to concur with the ways in which many listeners/readers/viewers are comfortable: the "artist as hero" is a suitable epithet. This – and such sections as those which deal with Cage's innovations in notation [end, Chapter 3, for example] – are typical of Haskins faithfulness to a rigor that refuses to sacrifice distance and perspective when advocating Cage and his deserved pre-eminence in the top rank of 20th Century musicians. Similarly, Haskins lucidly explains, in Chapter 5 for example, the composer's evolving understanding of, and arguments for, a nuanced relationship between spontaneity and improvisation in performance on the one hand. And the ways in which earlier music – Satie in choreographed work by Cunningham in the 1960s, for instance – was "fixed", like it or not. It must derive its strengths from being so notated. There is a similarly intelligent and perceptive discussion on Cage's relationship with (his) music committed to recording. At the same time, that Cage could be polemical and provocative is neither ignored nor minimized by Haskins. For example, the composer's altering of the syntax when his lecture on Communication at Darmstadt in 1958 was translated into German  (see the review of the relevant CD released recently - Neos 11213) so as to imply criticism of his audience for not really trying to understand his work. Haskins is even-handed in both alluding to this confrontational side of Cage, but then explaining it fully. Similarly, Haskins' dissection of Cage's social and political views is clear and open. For example, he implicitly endorses Cage's assertion that dogma is unproductive: people had better arrive at conclusions for themselves than adhere to a political movement because it seems to congrue with other opinions held– slogans rarely add much and group power (which could co-erce and intimidate) Cage saw as a bad thing . Such insights into Cage's own rigor can only do his cause good. Haskins' style is pleasingly crisp and transparent – the complexities and subtleties to which Cage sometimes seems to adhere are always clearly explained; yet without simplification. Where examples help to explain, they are chosen. Where they would merely add spurious rhetorical weight, they are not used. This has helped to make the inclusion and selection of material in what really is a short book so telling and appropriate. Of course John Cage can't claim to be exhaustive. And doesn't. But the book also competently alludes and makes reference to such topics as are outside its scope, but are necessary for understanding Cage's life and work. One of Haskins' more persuasive themes is the emotional power of Cage's music. This is dealt with to some extent by relating the author's own emotional reaction to it. This might have seemed indulgent; but in the event – because so well written, and also because of Haskins' prowess and engagement as a performer himself – it is not. There is a certain irony here: Haskins' book is largely predicated on an intelligent examination of the journey that Cage made from the mid-1940s onwards to "remove" himself from the process of composition. Most prominent in this respect is the role that Cage allotted (another paradox, perhaps) to chance. But equally important were the philosophical principles that dictated (suggested: Cage was not so dogmatic as is often assumed) that self-expression is scant justification for writing (music). These are themes that Haskins explores particularly convincingly. Significantly, Haskins' book draws on, reflects and is informed by the work of the likes of Leta E. Miller, David Patterson, James Pritchett and others whose work has obliged us to reassess Cage's aesthetic as it has appeared – initially and predominantly – in specialist journals, over the last 20 years or so. Haskins calls this work one of "demystification". His own assessments interpret such contributions to greater understanding nicely. Drawing on more widely-read sources, Haskins also makes good use of (the availability of) Cage's own writing, memoirs, and autobiographical material. The book has clearly arranged footnotes, a good bibliography, and a perhaps surprisingly short select discography, for a refreshingly large (over 300) number of CDs is currently available that are wholly or in part devoted to Cage's music. It's well laid out generally, easy on the eye in terms of font and white space and small enough to hold in the hand. Such a combination of content and production make Haskins' John Cage an ideal introduction and companion to the work, thinking and to some extent the influence of a composer whose place in music is still being assessed. Recommended. Copyright © 2013 by Mark Sealey.